Q American Series Digitally Recreates Legendary API 550a, 550b and 560 Vintage American Console Equalizers*. The equalizers allow you to chisel your signals with surgical precision. They have a modern, easy-to-use user interface. You’ll love their aggressive structure and proportional Q feature. These equalizer will keep you running tirelessly even after hours of hard work. You will not be able to help yourself from falling in love with it! 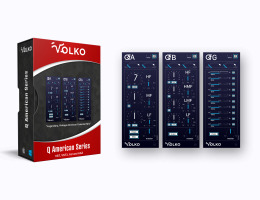 Unleash your inner mad scientist with the Q American Series plug-ins and add a special note to your music.